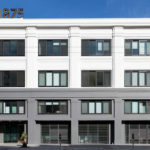 As we first reported last year, with the legal battle between the family that held title to the 1979 Mission Street parcel and the development team behind the proposed 331-unit project to rise up to ten stories on the corner site having been resolved and plans for the so-called “Monster in the Mission” having quietly been put back in play, San Francisco’s Planning Commission was planning to travel to the Mission for a special public hearing this past November. While the aforementioned special hearing was waylaid, it has been rescheduled for Thursday, February 7 in the auditorium of Mission High School at 3750 18th Street, starting at 4pm. 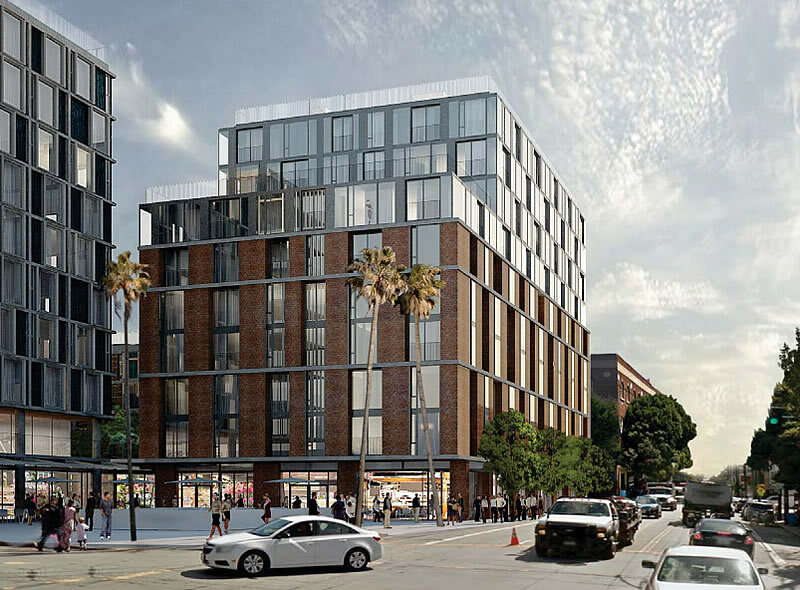 In addition to 331 residential units, the development would also yield over 32,000 square feet of new ground floor retail space, a garage for 163 cars and 162 bikes, and various streetscape and plaza improvements as previously proposed but likely to be refined. This is one of the premier drug, crime, and rat infested corners of San Francisco. It has significant historical relevance and should be preserved as-is. The fact that San Francisco is in desperate need of housing should not result in any changes to this special corner of the Mission. You are so right. I would feel as if the money I spent on a personal taser and pepper spray was wasted if I could wait for a bus or enter the Muni station on this corner when a project like this had made it clean and safe. I hope that never happens and the funky, nasty old San Francisco remains frozen in time forever. To whom/where can we send letters of support for this project? 100% Market Rate please. Would love to see this crime infested gritty corner cleaned up, but that may never happen w/ all the surrounding SRO’s, where the folks that live in those places have no living space, the the owners have their hands tied by the City. 100% market rate is never going to happen. It should unquestionably be mixed income, with market rate, middle income, and low income units. And conversely, 100% affordable shouldn’t and won’t happen. Posted by Make yer bets! I am making book on this project. Odds now 50 to 1, against. All bets please…. Perhaps it would help us move forward if journalists stopped using the incendiary and misleading language of development opponents. Just this week I have been very frustrated to see multiple sources use words such as “Manhattanization” and “Monster” to describe reasonable developments. These are just dog whistles for the anti-development forces that have created this mess we are currently dealing with. Agreed. The tone of the stories and perspective that sources showcase are as toxic as the NIMBY rhetoric itself. I think it’s actually become a kind of San Francisco brand of news—complaining and dog whistling. I’m totally drained by all of the idealism and distraction. We really need a better, clearer vision, with viable goals, and actionable plans to execute. Good point- I wish opposing groups could work to find compromises. Agree 100%. Socketsite, please note. Tired of looking at an empty burger king and an empty bar on the corner. Let’s build housing so that the community can flourish. The reputation of MEDA and Calle 24 is at all time low. With the # of developments in SF under construction at all time low – expect the Unions and laborers to come out for this project. 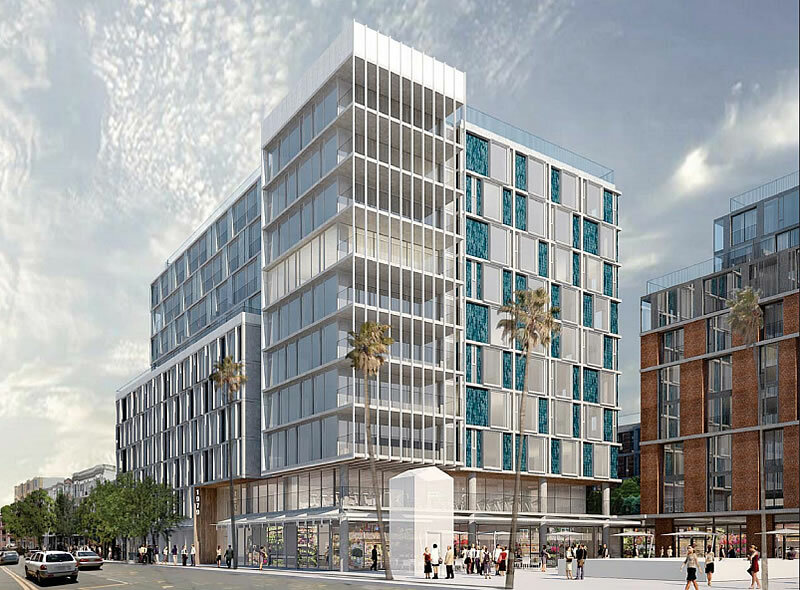 The issue is that the project is the same developer as Parkmerced (Maximus) same Architect team SOM, and same song and dance as prior, with zero public infrastructure improvements (transit) and a ton of impacts un-addressed by the development team. The project is only for entitlements, and than they will sell it off to let someone else build it but retain a portion for their pocketbooks. Wont help any affordability. Wont help any change in the process, or what is being built, and will only embolden developers to pave over every single story site and intersection adjacent to transit regardless of the impacts to people, and any existing community groups. SOM should focus these developments with Maximus outside the city, and push for these types of developments with new transit lines, where it is not currently located, Like Milbrae BART station near the airport. Don’t ruin all city blocks in SF with density and skyward developments that ignore who is building it and for what purpose besides “green-$-greed”. They tout the environmental side, but if you get in the weeds of the proposal it is far from green and impacts the community drastically. Care to elaborate on what sort of infrastructure (transit) responsibilities the developer is supposed to follow through on, on a project that sits directly above a mass transit station? Also, please share your thoughts (or facts) on what “environmental sides” the project team is touting. A) the current location at Bart and mission differs from the 19th ave location. But like Van Mess ave and Market more influx of people without transit changes is ludicrous. The van ness BRT should have extended further south and is taking way too much money away from other transit fixed outside the downtown. B) SOM always tours the “green” of their projects like parkmerced and this one as well. But the demolition of buildings is far from a green solution and takes years to recoup the carbon impacts. Two things… how should they improve public infrastructure here, and what do you mean by “pave over”? It’s not parkland; it’s already developed and highly urbanized. How should they implement a project supported by the community and not one that just pushes people out? -that should be the question. Which people are pushed out by this building? No-one lives here now. Who is it that you work for? Sounds like you have insight into something… or have been to the meetings? Aren’t you a contributor on one of those sites that relies on vague language to persuade people into questioning the facts without actually providing any yourself? I can’t tell. Was at all the prior Maximus meetings prior with Rosania and Seth Mallen from Stellar. This project should be transported out towards a major low scale unurbanized area…. how about Near Sacramento? We have too much housing being pumped in that is un-affordable to the existing community. Transported to a low scale area so people could drive, instead of putting it directly on top of a subway line? Green is not greed when you are angling for more taxes or fundraising for non profits. Society screeches to a halt without money. By the way if you make money, you don’t have to [depend] on the government subsidies. Geed is just slander, over used by people who can’t bother to pay their own way. 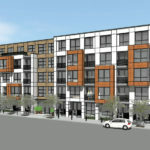 Millbrae has already approved over 800 units of housing adjacent to the BART station. SF needs to do its part also. I’ve always had the fantasy that they’d take the Caltrain right-of-way, dig a big, deep trench and put high-speed rail at the bottom, then BART, then a streetcar or buses that stopped more often, and cover it all over with bike and pedestrian paths and line the whole thing with big apartment/retail/office blocks, especially where the ROW follows El Camino. There is a place where fantasies of that kind come true — it’s called the People’s Republic of China. Check out news summaries written in the past year or two about how China built out 1000’s of miles of HSR all across their territory over a span of just 1 short decade. As much as I detest our lack of investment in transit and inability to make the sweeping changes necessary to build more housing… I’d rather be dead than live in a totalitarian, dystopian hellscape like China. One wrong word and off to the gulags you go with over a million Uighurs. The idea that we have to choose between dictatorship that produces fast results at a terrible human cost and a democratic process that moves insufferably slow is one of the biggest and most dangerous lies there is. Millbrae has an intermodal station it can take this density along with other cities along the peninsula. There are LITERALLY ZERO housing units on this site as it stands. Why is it your business if the developers become a minority partner in the project? That has zero to do with the outcome. This is a pretty smart play still, BART can handle this size of development and much more and there are many Muni lines going by running on the red carpet lanes. I’m not sure the streets could handle 163 new cars — trading parking spots for more units of housing would be a smarter idea. People make it seem like this development is right next to BART. I think they are overlooking the fact that BART is underground, maybe 100 steps down. It could be a 1/4 mile door to BART door. How did the city approve 163 parking spots? Should be 500 at least, right? i can’t tell. Is this satire? Tommi Avicolli Mecca is the real MONSTER in the Mission. A shameless hater of self enabled people… It’s just horrible people would be able pay their own bills and not be dependent on subsidies and welfare. We must not allow this deviant behavior. If you ever want to see the excess that this type of developer builds their own offices to just stop by One Maritime Plaza. Their workplace buildout looks to be over $300 per square foot in a class A premium view highrise. 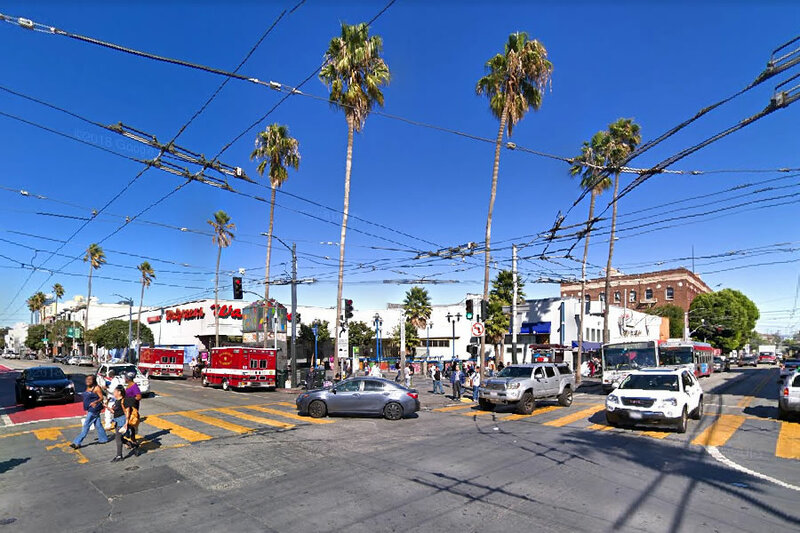 Please stop calling this the “Monster” in the Mission. It’s biased and inflammatory. How about the “Miracle”? Hate those monikers. Its like a Trumpian school yard bullying rally cry. Awful that the press repeats it. should be 20-30 stories, all market rate. no garage. that corner could really be something besides what it is. A 163 car garage. On top of a BART station. So what? People own cars. People need to store cars. If it’s underground parking, who cares? Yup, if the cars remain underground then nobody should care. But the reality is that those cars will emerge onto the surface frequently and add to congestion, slowing traffic. A dense city should care about street congestion as that resource cannot easily be expanded. I suspect most people who choose to live there (if ever built) would use a car very sparingly: like for large grocery runs; out-of-town trips; late night forays, etc. Big Deal. Like the guy above said, people own cars, people need space to store their cars. The typical frequency of use is already factored into congestion analysis. Cities that want to do something about congestion, do something about congestion. They don’t ban parking at home. We’re so busy “sending messages” we can’t do anything right. Eh, limiting access to inefficient modes like driving is one of the most effective ways to contain congestion. Did you have something better in mind? People who really want to drive have an enormous variety of options to choose from in the Bay Area. Why does every location need to cater to transportation monoculture? Agreed. Socketsite, part of the way narratives change is that language & terminology around them change. I suspect your loyal readership will remain loyal if you undertake a subtle shift towards characterizing new developments (of almost any kind at all) as positive, period. Definitely should NOT be built – Terrible idea….. This corner is a cultural treasure. The vacant lot is where Sir Walter Raleigh 1st encountered the Ohlone Indians… The shuttered Burger King is where the Whopper was invented. The Dollar Store sells irreplaceable plastic crap from China. And since MEDA and Calle 24 won’t ever take ‘Yes’ for an answer. Why bother….? Not that I think they’re reasonable to begin with…. Nothing monster like about it. Just a medium sized apartment building built beside a subway stop in a mediocre neighborhood. The amount of self importance and hubris in this town is however could fill a couple of episodes of Godzilla movies…. Quit talking and just build it. Remember when Foghorn said this project was dead? uh-oh…I see floor to ceiling glass windows. Isn’t that indicative of privilege? “Privilege” as used today is just a pejorative of success. When ever you see the word “privilege” just replace it with “success”. The UN CALLED THE BAY AREA HOMELESS CRISIS A HUMAN RIGHTS VIOLATION. If developers are not allowed to build new housing for the demand other developers will take 100-year-old existing housing stock kick out the tenants and renovate it to a modern standard. Our population is increasing at a rapid rate that we can’t control and change is inevitable. If we don’t allow housing to be built were just creating the problem, not the solution. By the way, this is not me. This is someone using my name.